Peter May's book tells the story of Larry Bird's last championship team. After an eventful, if four-day, work week, Dunreith and I were ready to relax last night. We had a typically tasty meal at Agami, a sushi place in Uptown, before heading home to watch Hot Tub Time Machine. Things go wrong, of course, and they end up in 1986. On a personal level, there are a number of similarities between that year and this one. In 1986, we had a car accident and death in our family. This year, we have had the same. 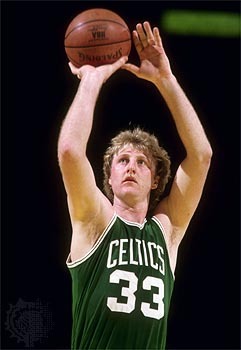 On a more cheerful note, though, 1986 was also the last of the three championships during the Larry Bird era. This year’s version of the Celtics came agonizingly close, before falling just short against our dreaded rivals, the Los Angeles Lakers. Peter May wrote about this year’s contest for ESPN, and has covered the Celtics for more than a quarter century. In The Last Banner, he writes about the 1986 team and makes the controversial claim that the team was the greatest of all time. For Celtics junkies, this is must reading. May takes the reader through the early season start, the famous collapse against the New York Knicks and Patrick Ewing on Christmas Day, the emergence of role players like Rick Carlisle, and then the steamrolling through the playoffs-a run that culminated with a six-game victory against the Houston Rockets. May’s discussion about the Celtics’ being the greatest team of all time found a receptive audience in me, was not entirely convincing. For fans who read and followed the team, as my brothers and I did religiously, The Last Banner does not break much new ground. But there can be something comforting in revisiting old terrian, as the characters did unintentionally in Hot Tub Time Machine. During the summer months, when the free-agency decisions of LeBron, D-Wade and Chris Bosh have dominated headlines, you can do a lot worse than reading May’s book.